Family pictures can be the hardest to frame, and Puritans make for appealingly restless subjects. In tackling the early American narrative, scholars must confront the thorny task of portraying the Puritan family with equal parts theological dexterity and sociological skill, a problem that seventeenth-century artists and modern historians alike have sought to refine. Scholars who take on the Puritans must address sin, salvation, and community-building in a way that does not make American democracy feel inevitable; further, they must seize onto the seventeenth-century peculiarities of transatlantic intellectual life in which the Puritans flourished and fell. Wrapped in New England lore and either exalted or disowned by their descendants, the cultural memory of Puritan contributions to the project of nation-building has inspired a broad spectrum of historiographical views. In the early 1940s, then-Harvard doctoral student Edmund S. Morgan and his colleagues would have encountered a popular narrative of Puritanism, one seemingly destined to smother any effort at new work: America’s Puritan “tribe” had briefly inhabited a tau(gh)t sphere, bounded by covenant theology and laden with impossible ethics, peopled by censorious prudes who excelled at capitalist rhetoric and balked at the sinful frivolity of a stray dance. Or… did they? Shuttling through the inner circuits of daily life while mapping the greater channels of Puritan social order in fewer than 200 pages, this book is a compact gem of balance. Morgan’s brisk analysis of church and society is planted firmly in seventeenth-century New England, but the wider world of Puritanism as an intellectual movement beckons along the reader at several critical turns. It is a messy world of constant theological invention, full of thinkers and over-thinkers, bubbling up a storm of theological musings that pair well with Morgan’s chosen literary method of essay. Puritans, Morgan argues, constantly attempted to live religion but they were far from resolute in their shared path. “The Puritans’ strength lay not in confidence but in lack of it,” Morgan writes, pointing to Puritan diarists, like Samuel Sewall, who compiled assiduous private ledgers of sin and doubt. In diaries and letters, in the frequent contest of wills that (quite literally) transferred land and power between men and women—even in the way that they courted or cursed their “brothers” and “sisters”—Morgan finds that Puritans were a surprisingly innovative and self-conscious bunch of “saints.” His judicious use of personal narratives shows his early flair for weaving local history into a longer timeline. Snippets from sermons and works of Puritan heavyweights, for example, are interlaced with more personal stories of Puritans at home, as befits a book centered on family. Morgan knows when to let the Puritan pulpit stars shine, and when to pull them from their posts. 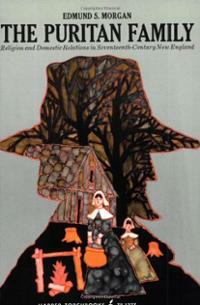 More than a half-century on, Edmund S. Morgan’s The Puritan Family still makes for a refreshingly good read. (It is interesting to consider, also, how interpreting Puritan talk of “covenants,” “isms” and “society,” and the “law of relatives” was influenced, if at all, by the ideological culture of the Cold War era that Morgan experienced). Puritanism should be reassembled for fresh inquiry, Morgan suggests, and what we learn of those who lived it (specifically, how the Puritans “committed the very sin that they so often admonished themselves to avoid: they had allowed their children to usurp a higher place than God in their affections”) may radically alter older narratives of American formation. There is another good lesson, here, for today’s dissertation writers. The Puritan Family, though masterfully contextualized throughout the chapters, ends with a reintroduction rather than a grand conclusion. Nor is Morgan entirely rosy about Puritanism’s effect on family, or how theology is shaped by society. Ever generous with his sources, Morgan is open with these more difficult stories—young children sobbing through their morning Scripture, Puritan masters whipped along with their servants, the “very sore trial of the family bonds” resulting from Anglo-American commercial kinships reforged in marriage—and it is because, even now, the Puritan family portrait is worth another look. With mention of Perry Miller’s The New England Mind, Morgan defines the Puritans’ Ramist logic as a “copy of reality,” notable for “its symmetry: reality fell very neatly into dichotomies in a hierarchical order, so that its structure could be diagrammed on a single page with the assistance of successively larger brackets.” For some reason, this came to mind. Thanks Sara – not only highly informative but beautifully written as well. What strikes me most about this book is how Morgan is able to combine social and intellectual history in very compelling and interesting ways. Post-cliometrics these two analytic frames have drifted apart, more or less, to the loss of both. I’m only familiar with the 1966 publication, not the 1942 dissertation and 1956 edition. He explains the major revisions in the introduction, but I noted 1964 citations in his brief foray into “just war.” I’m curious as to whether this passage is a revision or a novel contribution to the 1966 edition. In any event, I found your review quite engaging.